Rev. Jane Spahr goes on trial today for marrying 16 same-gender couples. These weddings were legal in California at the time. There is quite a bit of media coverage. I especially enjoyed this editorial, Why Rev. Jane Spahr Should Be a National Religious Icon. Imagine being persecuted for celebrating love. Sound like the spirit of a Shakespeare tragedy? If only this were a story of fiction. Meet Rev. 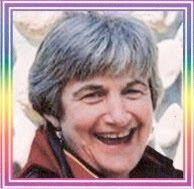 Jane Adams Spahr, a retired Presbyterian minister in California. Today, Rev. Spahr will be hauled into a Presbyterian court, and put on trial for potentially violating the constitution of the Presbyterian Church. What did she do that was so heinous? ...."As a matter of my conscience," Rev. Spahr says, she "cannot be a part of … people being seen as second class or less than. I have seen the violence it has done...."
That's the truth. Do read the entire editorial. Ray Bagnuolo and Will McGarvey suggest that Rev. Spahr is not on trial at all. The Presbyterian Church (U.S.A.) is on trial as to whether it has moved beyond hypocrisy, bigotry, and superstition. The trial itself will be interesting. The Presbyterian prosecutor will put Rev. Spahr on a scale. If she weighs the same as a duck she is made of wood and therefore a lesbian. Presbyterians are wise in the ways of science. "The Rev. Robert Conover, executive of the Presbytery of the Redwoods, eventually received a complaint that Spahr had married the two women. The filing included a newspaper story and a certified copy of the marriage certificate signed by Spahr. The accuser has chosen to remain anonymous. A church committee investigated the accusation and decided to bring charges against Spahr." How is it even possible in a case like this to bring anonymous charges, and what Presbytery in its right mind would even bother investigating anonymous charges like this? Can someone who knows more about the BoO than I do please explain to me how this is even in order? We are the same bunch who try people twice for the same alleged crime. Rev. Conover explained himself to the Mercury News, in Josh Richman's article this morning. Reading between the lines, I wonder if he and the Presbytery see it as a test case, to force the Church to face the changes in state laws and answer whether we turn aside couples who can legally marry. "We'll see who budges first - church or society." "We are the same bunch who try people twice for the same alleged crime." Well, if the other side plays it's usual game of being completely inept and bumbling, my prediction is that they'll completely screw up their prosecution then blame the PJC for the outcome. As I've said before, I don't think their strategy is inept, I think inept *is* their strategy. Yes, what is on trial is the church. My question to all legal eagles. If Jane is acquitted, it cannot be appealed, right? Otherwise it would constitute double jeopardy and the GA this summer said double jeopardy is a no no based on what happened to Rev. Jean Southard. If that is the case, then Redwoods, calls her innocent, it is a done deal and sets precedent. The process in the Rules for Discipline requires that the person who made the allegation sign their name to the allegation. The Stated Clerk of the Presbytery, the Investigating Committee and Janey all know who made the allegations. They aren't supposed to tell anyone. And the only person who is allowed to say publicly that charges have been brought against Janey is Janey. As for the question of taking charges to say the Synod PJC I believe now the only way charges can go up that latter is if someone alleges that the Presbytery PJC made a procedural mistake. As for precedent a not guilty decision by the Presbytery PJC would only make it a precedent in that presbytery. It would have to go up to the GAPJC to set a precedent across the denomination. Personal guess? She will be found not guilty in the Presbytery of the Redwoods. Or, which would be more interesting, the GAPJC would probably say again that no matter what the state said and no matter what Janey and everyone else present thought, it still wasn't a marriage. It's so weird, when you have gay neighbors and co-workers who are perfectly normal like anyone else, to look at how churches and others get so spun around by this issue, it's like an anthropologist looking at the odd customs of a central African tribe or a Martian or something. I know. This is so freaking frustrating. I am so barely hanging in there with religion, by a thread. Many of the people who are intelligent, who care about justice, who actually do stuff, are my atheist friends. I am not sure if philosophical atheism is their thing, primarily, but they are just so disgusted with the evil of organized religion. It is hair-pulling to work inside an institution that is so wrong. But I think of people like Rev. Jane Spahr, who keeps at and keeps smiling. I figure if she can keep going I better as well. Bob, That's what I thought. So I'm assuming that the paper must have gotten it wrong, and the charges weren't actually "anonymous" as reported, but instead the name is confidential. Well, that's what I'm assuming. Having seen first hand the level of ineptitude that comes from the clowns that make these charges, who knows what they've tried to get away with. A correction. I believe that the only way charges can be appealed by the prosecution if the defendant is found not guilty now is if the prosecution alleges that the court made procedural mistakes. The defendant can appeal for any reason if found guilty or innocent. I think the GA made an AI on this. One last thought: if I was on a PJC or a judge in secular court I would require that all phones be turned off. No talking, no texting, no emailing, no twitterring. All are disrepectful and interrupt the proceedings of the court. The rest of the world can wait for the news until the end of the day. So their dark deeds can be done in secret? Nah. I am all for full and public disclosure especially regarding trials of conscience. Everyone needs to see what is at stake and to hear and follow the testimony of the witnesses. John the trial is open to all who wish to attend. People can tweet text and email at breaks. I would think it would be difficult for the PJC, the defense and the prosecution to concentrate on the case with constant clicking in the background. We ask people to turn telephones to vibrate during worship. I am sure in secular courts the judge gets pretty angry if she hears phones ring, people talking on their phones, texting, emailing or tweeting. You might get a contempt of court citation there. A little politeness for the court would be nice. Disruption is one thing, but tweeting is another. It is no different than taking notes. John go ahead and head down to the county seat, if you aren't already there. See what a criminal court judge would say if you tweeted in her court. "See what a criminal court judge would say if you tweeted in her court." Well, 1) any time the PCUSA has attempted, for the sake of decorum, to limit access, the BFTSs have lost their minds about how terrible that is, and 2) a criminal court is very bad analogy for a PJC trial. "Well, 1) any time the PCUSA has attempted, for the sake of decorum, to limit access, the BFTSs have lost their minds about how terrible that is, and 2) a criminal court is very bad analogy for a PJC trial." Let them all in and if the don't behave kick the out. If the clicking bothers the PJC or either counsel, give one warning and then kick them out. I referred to criminal court because of the difference between remedial cases and disciplinary cases. Disciplinary cases are more analogous to criminal cases. But I will concede and suggest that the test be conducted in civil court.